There are at-bats. And the possible positive outcomes of those come down to three: hits, walks and batters hit by pitches. Hits can be separated in singles, doubles, triples and home runs. Hits by pitch are pretty much what they sound like. Walks, on the other hand, are bases on balls awarded by the pitcher to the batter either unintentionally due to lack of control or intentionally to supposedly prevent the hitter for inflicting more than single-valued damage by giving him the first base for free. The intentional base by balls have always been present in baseball. They have been tracked, though, since 1955. From that point in time to 2016 (the last complete season with data available), a total of 73,272 IBB have been awarded to batters, for an average of around 1,182 per season. If we look at the full picture, though, there have been more than 11 times more BB than IBB in the same period of time. Obviously, hitters are not awarded a base for free if they have not gained a certain status in which pitchers “fear” the possibility of them being punished by a bomb to the outfield that holds high value and could turn into runs for the opposing team. Even with that, IBB rates are at their lowest since 1955 due to strategical improvements and the study of the game, which has led to the conclusion that awarding bases to hitters for free is more than probably not the best approach. But with more than a thousand instances per season on average, we have a big enough sample size as to have some fun with the numbers and try to think of a baseball world in which IBB had been somehow vetoed by the MLB and therefore not awarded to hitters from 1955 on. What could have this meant for batters during this span? How much could have it impacted the hitting totals for some of the already-great hitters of baseball history? Let’s take a look at the data. Counting from 1955, only five players have had careers in which they have posted an IBB/PA larger than 2% in at least 10,000 PA. Barry Bonds, Hank Aaron, Ken Griffey, Albert Pujols and David Ortiz. Those are some scary names to have at the home plate staring at you while playing the role of the pitcher. If we lower the threshold to 1% IBB/PA, we end with a group of 39 players, more than enough to get some interesting testing. The first thing that jumps out and we could expect is that only one of the 39 players fell short of the 100 HR mark (Rod Carew, with 92) and that all of them surpassed 2223 hits during their careers (for that matter, only 110 MLB players since 1955 have got to that mark, so players from our group make for 34% of them). So, back to our group, the correlation between IBB and HR yields an R-value of 0.256, which is more or less significant. This means that power hitters have historically tended to be awarded more bases by balls than any other type of batter. If no IBB had been allowed in baseball, we would only have hits, unintentional walks and hits by pitch left as our possible plate appearance outcomes. By making a simple set of calculations we can come up with how many extra hits, home runs, etc. each of our players could have ended their careers with had they not being walked on purpose during their playing time. It is just about knowing the rates they hit singles, doubles, triples and homers per PA (subtracting IBB outcomes from the total number of PA) and then multiplying those rates for the IBB each of them were awarded in their careers. This way we can have a simple look at how much better numbers those hitters could have reached based on their pure hitting ability. The case of Barry Bonds is truly unique. The all-time home run leader not only lead the IBB leaderboard with 688, but the difference between him and the second ranked player (Albert Pujols, 302 IBB) is a staggering 386 IBB, more than doubling him. 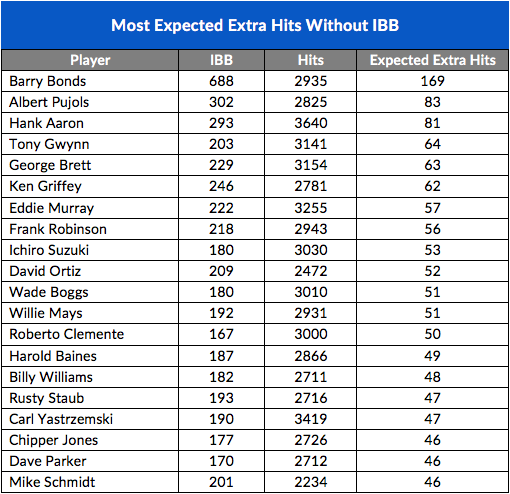 The difference between Pujols and third-ranked Hank Aaron is of 9 IBB, just for comparison’s sake. In order to get a comprehensive list of the most improved players in this alternative world, we can sort them by the number of extra hits (no matter the type) they would have got had they not received a single intentional base on balls. The next table includes the 20 players with the most expected extra hits to gain in this scenario. Unsurprisingly, Bonds comes out first – and by a mile. Again, Barry doubles the EEH of second-ranked Pujols and would have finished his career with over 3,000 hits, at a 3,104 mark. That would make him the eighth player in terms of hits among those analyzed, while Pete Rose (not in the table above) would have gained 45 hits to surpass the 4,300-hit mark and reach exactly 4,301. By breaking the hits by category the outcome at the top is the expected, with Barry Bonds always topping the simulations. Clearing him from the picture, Hank Aaron would have hit the most extra singles with 49, followed by Pujols and Tony Gwynn with 48. Speaking of doubles, Pujols would have got an extra 18, and three players would have 13 more than what they reached in their careers. Triples are much less frequent and only two players, Roberto Clemente and George Brett, would have batted for three extra triples. Finally, in the home-run category, Bonds would have hit for an extra 44 homers, followed by Pujols and Aaron (13 plus) and Ken Griffey. Had all these numbers been real and IBB cleared from the face of Earth, historical career leaderboards would have not changed a lot, at least at the highest positions, but some records would be seen as even more unbreakable than they are now. Someone would have to break the 4,300-hit barrier again to surpass Pete Rose. Bonds’ new mark of 806 HR would be unimaginable to reach by anyone nowadays (Pujols, still active, would be almost 200 HR away while entering his age-38 season next fall). It may not had been a critical change, but baseball would have been (and be) way more fun to watch. Just looking at our starting 39 guys, we would have seen the ball being hit 1,928 more times (out of 7,423 IBB, which is a 26% more than we have), witnessed 300 more home runs being called and annotated a couple of unthinkable numbers in MLB’s history books. Now just imagine how much baseball-fun we’ve lost if I remind you that there have been 73,272 walks awarded during the past 61 seasons (yes, your calculation is correct, around 19,000 extra hits by our group’s measures). We hoped you liked reading A Baseball World Without Intentional Walks by Antonio Losada! Antonio Losada is a freelance writer lost in the world of statistical and data-driven analysis of sports, namely the good old national pastime that baseball is. You can find him on Twitter and read more of his work at Holyfield. You could eliminate the intentional walk (at least theoretically), but there is no way that you can force a pitcher to throw strikes if he doesn’t want to give the batter any opportunity to hit the ball. Yes. The pitcher could still throw 4 chin high ones if IBBs were outlawed. I’m all for the IBB resulting in two bases instead of one suggestion. Although, that would result in the intentional unintentional walk though, huh? I wonder how that could be avoided? (Somewhat) unrelated, what about the HBP being awarded two bases? I can’t think of a way that could be circumvented. Thanks for the research and fun article. It provides the springboard for imagination.